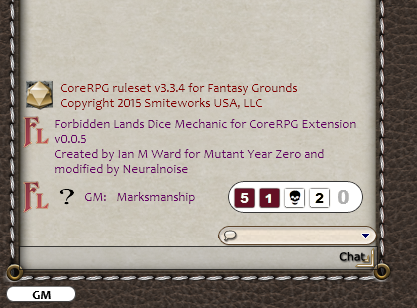 I modifie the extension MYZ Dice Mechanic of ianmward for Forbidden Lands (color dice). I'm working on the character sheet and share it when it's done. Last edited by Neuralnoise on Tue 08 Jan 2019, 22:53, edited 19 times in total. Which colour palette are you using? There can be a lot of interpretations for "maroon", for example. Might be worth getting in touch with @Tomas to confirm the palettes they are using for the custom dice so you can get your hex values to match. an application acting as a virtual online gaming table primarily intended for pen and paper style narrative role playing games. It is designed to perform many of the things you can do while playing at a conventional gaming table and move it online. Haha, fair enough! Looks good! ianmward share me his extention which add a pool dice next to the modifier. I integrated the DicePool.ext inside the ForbiddenLands.ext. Just watched your YT video and picked up a little typo. Strength is spelled "Strenght" on the character sheet. Good video, otherwise! Link in the first post is down, can you please check and fix?